Being handed a diagnosis of fibromyalgia can be really scary. Let’s talk about the emotional whirlwind and steps you can take to move forward. Welcome to Fibro Pulse! I’m Linda. We wanted to do a video about being newly diagnosed, so we posed a question to the community about they wished they had known when they were first diagnosed. 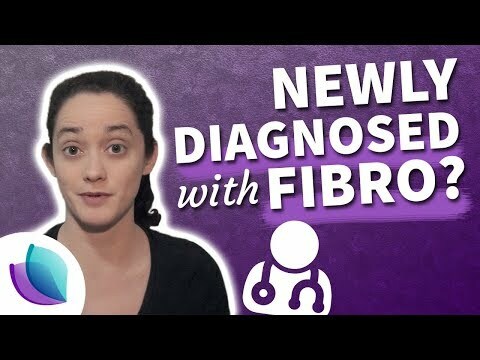 So this video is the result of a community effort to try to get you off on the right foot on your fibro journey. Generally speaking, the responses I got were a lot less practical in nature about physical symptoms and the like. They were more about the emotional and mental and social toll that fibromyalgia takes on your entire life. I can’t say that I was surprised, because that’s been my experience too. The mental and emotional toll that fibromyalgia takes on you really stands out because the pain fluctuates, the symptoms change over time, but the things I remember are the times when I wanted to do something and I couldn’t because of the pain. And those are the things that really stick with you. Every person with fibromyalgia has a very different diagnosis story. For me, I was very sick with a bad case of mono, and afterwards I had trouble getting better and the pain wasn’t going away. So my diagnosis was relatively quick and close to a specific incident that triggered it. I remember when I was diagnosed that it was very bittersweet. It felt great to know that there was a name for what I was experiencing and that other people were experiencing it too, but finding out that it was a condition that was somewhat mysterious and didn’t have a cure or some type of specific protocol or treatment that could make life easier and that you more had to figure it out on your own what worked for you was very daunting. After all the tests and uncertainty and not feeling better, it was very helpful to have something to hold onto, and in having a name, I knew that there was a community and resources out there that I could have access to. One of the things that might not be readily apparent to people who don’t have a chronic condition, but really comes to the forefront once you’re dealing with it yourself is the mental health aspects of having a chronic condition that’s incurable. Knowing that you have a chronic condition that isn’t going to just get better can really start to weigh on your mind. When you know you’re going to get better, you say “Oh, I can get through this and move onto the next,” but when there’s no end in sight, that’s when the depression and anxiety and stress of just having the condition can really start to weigh you down. It came up in our discussion of this topic to remember to consider your mental health when it comes to chronic illness and fibromyalgia because of this. Chronicwho brought up the point that mental health can sometimes fly under the radar when it comes to treating fibromyalgia and chronic pain and that it’s essential to think of them together and to treat the physical and mental symptoms for a holistic approach to wellness with fibromyalgia. Dealing with a chronic condition is difficult enough on its own, but many of us came to find out that people in our lives were not as understanding or accepting and supportive as we might’ve hoped. It can be very difficult for people to understand that there’s something different about you now, so with a chronic, invisible condition, they don’t see any change, you know, it’s not like something about you has changed that they can recognize every time they look at you. The change is happening on the inside. So it can be confusing for people that you suddenly can’t do things that you used to do before and they sometimes even get angry that you’re not the person that they used to know. Many people in the fibromyalgia community report that friends and family members began to distance themselves from them after their diagnosis. For example, if you have to cancel plans with friends, they might start to think that you don’t like them and you’re just making excuses. Or, perhaps, trying to convey what you’re experiencing – some people might see that as you being a downer and not want to be around someone who’s complaining or in pain all of the time. However, there are people who can understand what you’re experiencing, and that’s why it can really help to have fibro friends to show you support. Sara C. commented that in the beginning the doctors just gave her medications and blanket statements, and she didn’t realize that there was so much community support out there. Creating this community was the main inspiration behind us wanting to start this channel and website, so that we could bring people together to have more meaningful discussions about how fibromyalgia affects our entire lives. So now that you’ve been diagnosed, how do you re-calibrate your life to match your new circumstances? In life, we’re all just trying to do the best we can with the hand we’re dealt. Amelia Rae commented that through it all, she’s still trying to become the best version of herself. At the moment, you might be feeling a bit down about your new diagnosis, but fortunately our minds are wired to adapt to new circumstances. Over time, people with chronic conditions learn to adjust to a new baseline, and one of the upsides is that having a lack of energy makes you really focus on the things that are most important to you. So when we’re talking about being the best version of yourself, it’s working with what you have and focusing on what’s most important so that you can actualize those in your life. Are you recently diagnosed? If so, what’s going through your mind right now? If it’s been a while for you, what do you wish you had known when you were first diagnosed with fibro? How have you been able to connect with others with fibromyalgia, if at all? Please put your answers in the comments section below. Thanks for watching! Remember to subscribe, like & share Follow us on social media And then come join the community at fibropulse.com.